On the first anniversary of Donald Trump’s presidency, the future of the transatlantic relationship is as uncertain as ever. According to Lisa ten Brinke, the rift between the EU and the US began before Trump entered the Oval Office, and this is not likely to change any time soon. Just over one year ago, the world watched as Donald Trump became the 45th President of the United States. In Europe, his inauguration signalled the beginning of an insecure and unpredictable time for the transatlantic relationship. As Trump promised to put ‘America First’ and called NATO ‘obsolete’, politicians, journalists, and citizens on both sides of the Atlantic feared for the future of US-European relations. Trump’s strong rhetoric during the campaign, in which he denounced the Washington elite and their foreign policy approach, implied he would move away from the liberal world order towards a more isolationist worldview. Trump promised to break with President Obama’s legacy, pledging to walk away from international arrangements as varied as the Iran nuclear deal, the Paris climate agreement, and multilateral trade negotiations such as Transatlantic Trade and Investment Partnership (TTIP)—all policies made possible through cooperation with European allies. From now on, Trump promised, it would be ‘America First’, and long-standing allies could no longer bank on US support. Following this threatening rhetoric, however, surprisingly little has happened. As a response to Trump’s failure to commit to NATO’s Article 5, which outlines the commitment to collective defence, his cabinet rushed to reassure American allies that the US government was still committed to European defence and security. Trump’s words were written off as “tough love” by his National Security Advisor, H.R. McMaster, while his Defence Secretary, James Mattis, gave a passionate pro-NATO speech at its headquarters in Brussels. Soon after, Trump adopted softer language, claiming NATO was now “no longer obsolete”, and declared to be “totally in favour” of the “wonderful” EU. In line with this new rhetoric, the US did not make any changes to its troop contributions to NATO. The slow pace of Trump’s foreign policy action has provided European leaders with new sparks of hope, highlighted by the recent call to US officials to reconsider their stance on the Iran deal. Europe seems to believe, perhaps not unreasonably, that new rhetoric does not have to mean a new reality. For Europe, this rift could be the wake-up call needed to step up its game. In addition to the kick-off of Permanent Structured Cooperation (PESCO), Europeans will need to rethink the continent’s dependency on its American allies. This does not mean Europe needs to break away from a historical alliance, and it may be unrealistic to think that Europe can become fully independent from American military support. Rather, it is now up to Europe to balance a long-standing friendship with a healthy dose of pragmatic policymaking. The nature of the transatlantic relationship has been changing for years. Even when Trump’s rhetorical damage ends with his presidency, Europe will be left to grapple with this new reality. 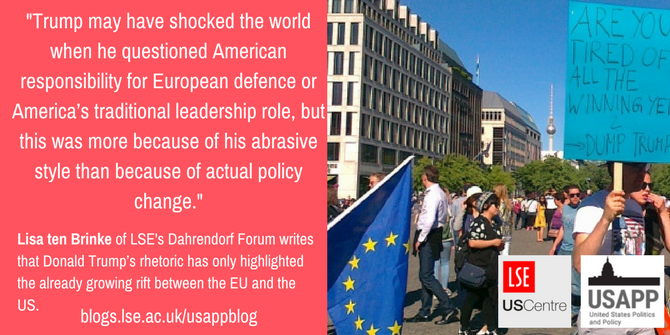 Note: This article originally appeared at the Dahrendorf Forum blog and USAPP. It gives the views of the author, and not the position of EUROPP – European Politics and Policy or the London School of Economics.